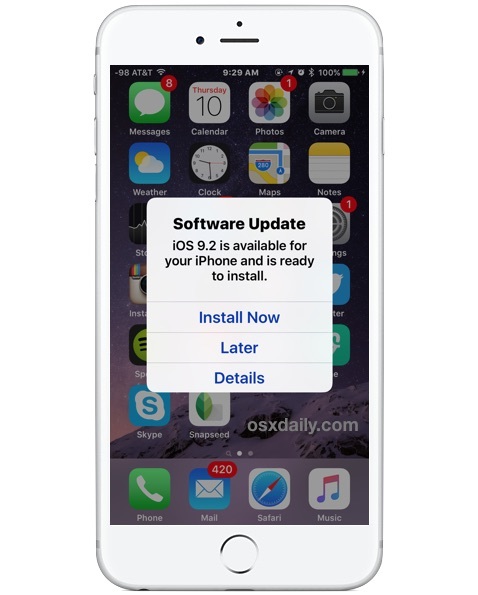 Your iPhone, iPad, or iPod touch will now notify you when a new iOS Software Update is made available, as you may have noticed by now. When you see the Software Update screen popup on your iOS device with the message “iOS (version) is available for your device and is ready to install” you’ll be presented with three options, to install now, to get details about the update, or the option we’ll focus on here, “Later”, which allows you to postpone the update to be reminded again later about it, or have it install itself automatically in the middle of the night. This tutorial will show you how to enable the feature which allows iOS system software updates to automatically install themselves onto an iPhone or iPad. This requires an active internet connection on the iOS device, but beyond that it’s a very automated process. Note this auto-update feature is only available on modern versions of iOS, so any device running a release prior to 9.0 won’t have this option available. 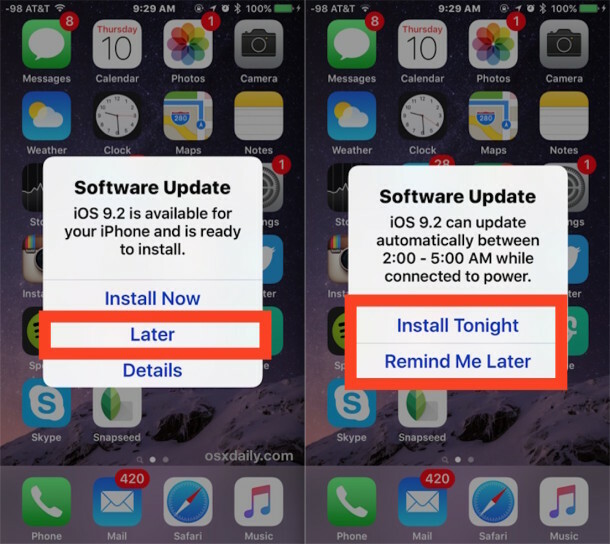 Assuming you’re up to date with a modern iOS release on that iPhone or iPad, here’s how you can use this handy feature to install your system software updates automatically when you aren’t using the device. The “Install Tonight” option is undeniably useful, it updates your iOS device while you sleep, and you’ll wake up to a device with the latest version on it. This works the same with iPhone, iPad, an iPod touch, but as mentioned before be sure you have iCloud automatic backups enabled before choosing this option. This option is available in the Settings > iCloud > Backup section, just be sure that iCloud Backup is turned ON to have the feature, and you’ve likely encountered it before if you have backed up the device before. The reason to have automatic backups on may be obvious to some, but basically it insures that if in the odd event something goes haywire with the iOS software update, you’ll be able to quickly restore and recover your stuff. Absolutely do not use the automatic software update feature without having automatic iCloud backups enabled, it’s rare but if something does go wrong with an iOS update, you could lose your stuff without the backup, and that’s simply not worth it. The only exception to this is if you religiously start iCloud backups yourself manually or through iTunes manually, but just as with installing iOS updates on your own, always back up before updating software. One other thing worth mentioning is that the aforementioned automatic iOS Software Update feature will download the iOS update to the iPhone, iPad, or iPod touch automatically as well. This can take up space, and if you don’t want to install the update this way, you can always head to the Settings app and Storage section to delete the software update from the device before it installs. In rare circumstances if you haven’t updated in a while, the wrong iOS software update version will be stored locally and thus offer an inappropriate release, which is easy to fix by removing it. There are similar automatic update options available for auto-updating apps in iOS, and Mac users can choose to have the Mac automatically install app updates itself or automatically update OS X system updates as well, but for either case, be sure you use a regular backup routine to preserve your data. This notification continues to pop up until I allow the update and I want to choose when I update. It is annoying. I don’t know how to stop the constant notifications to update when the ipad/iphone opens. Can you please help? You can’t ignore the update, you can only delay the update, or install the update. Welcome to Apple 2015! Just like Microsoft in 2002! You have many choices as long as it’s the one choice they want. To make matters even worse, the update will keep downloading to your iPhone or iPad, constantly, no matter how many times you delete it. Total waste of bandwidth with ZERO consideration on bandwidth limitations or low bandwidth situations, I live in a rural area with cruddy internet service and limited bandwidth, between iCloud and iCloud Photo Sync and iCloud WhateverTheJunk and iCloud Pro Junk Plus Edition Pro and iOS updates and all this other junk Apple rams down your throat that you can’t opt out of, it uses all my bandwidth. Apple is really getting out of control. This sounds very fishy to me. I have •never• heard of Apple forcing anyone to update software, automatically or otherwise. The Internet would be lit up with complaints if it were the case. I could be wrong, of course, but it’s news I haven’t heard. One more thing. While the update popup may indeed keep bugging you, you certainly do not •have• to update. The annoyance of having to see the notice would pale in comparison to installing an iOS you didn’t want later. But you ain’t turn the updates off. Just like (without the command line) you can’t get rid of the “Make Safari your default browser” on your desktop. I agree with the original poster’s sentiment and disagree with Apple’s approach lately. I had a refurbished iPod decide to download a nearly 1GB update without telling me while I had it connected through my iPhone for initial activation. Not the end of the world, since that is my only internet connection and I have lots of bandwidth, but it was enough to get me to seriously conserve for a few days, which meant no synchronizing the iPad with Dropbox. The end result: I figured out some good ways to use my Surface as a viewer and never went back to the iPad. Without the iPad, it became a pain to get files off the iPhone, so I went back to my old Droid. And due to other issues with Apple updates, I’ve been using my Surface instead of my Mac, and will probably install Linux on the Mac. Friend experienced something similar after buying a new MacBook Pro, noticed his internet service was extremely slow, used nettop to discover some Apple cloud services doing who knows what but destroying bandwidth at 5mbs for many hours. Unacceptable! Knowing no better, I have been updating when notified to. I have ipad air 1. I absolutely hate it and each time I have updated the ios the &$@# thing gets worse. I now have all kinds of unwanted aps showing on the home screen and a calendar page I don’t want. I went into settings long ago and silenced Siri. I am elderly and don’t want most of what this ipad has for offerings. I liked my ipad 1. The ads alone on this thing are obnoxious. I really would like to ignore the ios updates in that I like to get to where I want to be faster. i will never get another ipad. I cant even turn a page in my ibook without dragging some screen from the right side instead of turning the page. Also, while reading the screen sometimes goes dark with light lettering while I am reading and I can’t do anything about it, because I don’t know what I have done to trigger it. A picture of a lock sometimes appears while I read. What does that mean? Yes I Have a question, during tonight when your going to update our software Iversion had this stupid icon I’ve been trying to get rid of i am hoping you will delete this icon it’s been on my Tablet for about 3months and I’ve tried believe me to get rid of it pls tell me you’ll get rid of this icon ito blk with a white exclamation mark I heard maybe it’s so one spying on me please help me in getting rid of it Thank you Noel Marciel please Notify me ..
Automatic updates are like russian roulette. Sometimes they work fine and other times you end up with problems. Apple needs to have a setting where if you are happy with the current IOS you are running you can disable further updates until YOU decide you want them. No more nagging about an update you do not want or intend to apply. Its crazy that a device with a limited amount of storage have its memory used for something you many never choose to apply. I guess that’s how apple can force you to spend more money for a device that has more memory. I have a problem with my phone because it’s updated software please help me .